"I found a variable "v_4" in an old data file and I can't remember how exactly I created it. The syntax I used got a bit messy, I have different files and they're in different folders. Is there an easy way to find out which syntax files contain the expression "v_4"?" 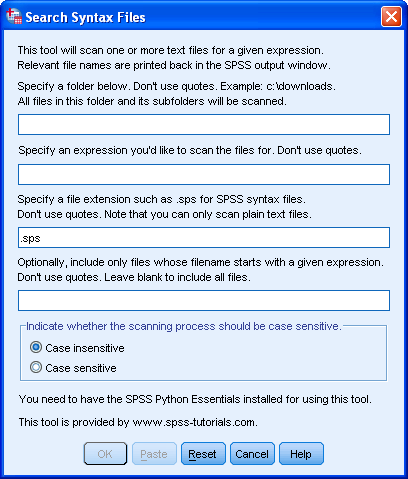 Next, download and install the SPSS Search Syntax Files Tool. Note that this is an SPSS custom dialog. Click Utilities Search Syntax Files. Specify a folder, a search expression and a file extension. Optionally, specify the first character(s) of the file names you'd like to search. The full paths to all files containing the search expression are printed back in the SPSS output window. All files containing plain text can be scanned with this tool. This includes .txt, .html, .csv and .py files. Note that MS Word (.doc) and Excel (.xls) files do not contain plain text and therefore can't be scanned by this tool. Note that you can copy-paste paths from the SPSS output window into Windows Explorer in order to open files. We offer consulting to foreign clients but we do require advance payment in this case because we can't sign formal contracts. I'm currently on holiday until the 22nd. However, if you can send the details regarding your request, I'll try and look into it and come up with an estimate of the hours and costs. I need support on statistical data analyses using SPSS. In what way you can help me?